"Fetch" may never have happened (sorry Gretchen Weiners) but SS19's new season trends have hit the runway and high street fashion retailers are quickly following suit. A quick scroll through glossy fashion websites will reveal a whole host of trends for spring 2019 style. And (of course) there are some really odd ones. One fad that especially puzzles me is described by Elle as "low key utility style". With bright orange jumpsuits, bum bags that resemble toolbelts, and waist cinchers which look like car seatbelts, this trend seems to be inspired in equal parts by your local plumber and an escaped convict. While the fashion mags seem to love this trend, right now, I'm unconvinced. I can't say I'm a massive fan of this look but who knows, maybe by the end of spring, I'll be rocking a boiler suit and chunky black boots too. Another trend that I'm REALLY bummed out about is this season's colour of choice. Fashion writers from Vogue to Cosmopolitan are all extolling the virtues of beige. Groan. Instead of simply calling it beige, designers have slapped fancy names onto the colour as well, christening it everything from "contemporary oatmeal" to "stony ground". Whatever you call it, hun, it's still beige. As you can probably tell, I'm feeling distinctly "meh" about the clothing that's hitting our stores this season, but instead of turning this post into a total diss track about how all the designers, frankly, have got it wrong, I've decided to write a list of style alternatives - featuring fashions that I'd like to see in style instead. You ready? It's going to be a fun one. Given the fact that I've just ranted about how much I hate the colour beige, there's no prizes for seeing that bright clothing in all forms has made my list of ideal spring trends. Thankfully, alongside beige, neon is a big trend that all fashion mags seem to be loving this spring, so colour hasn't been thrown out completely. However, I must admit that I'm not really a fluorescent kinda gal. I'm all for bold, bright, and vibrant, but I'm less keen on things that look like they're going to glow in the dark. That's why I selected this bright nature-inspired top for this post. I love the vivid pinks and yellows of the blossoms and butterflies on this 3/4 sleeve shirt. The combination with the earthy greens of the foliage really makes me think of spring. I also opted for mellow tones for the trousers and jacket: the deep blue of the paper-bag waist trousers provides a nice contrast with the natural colours of the shirt. 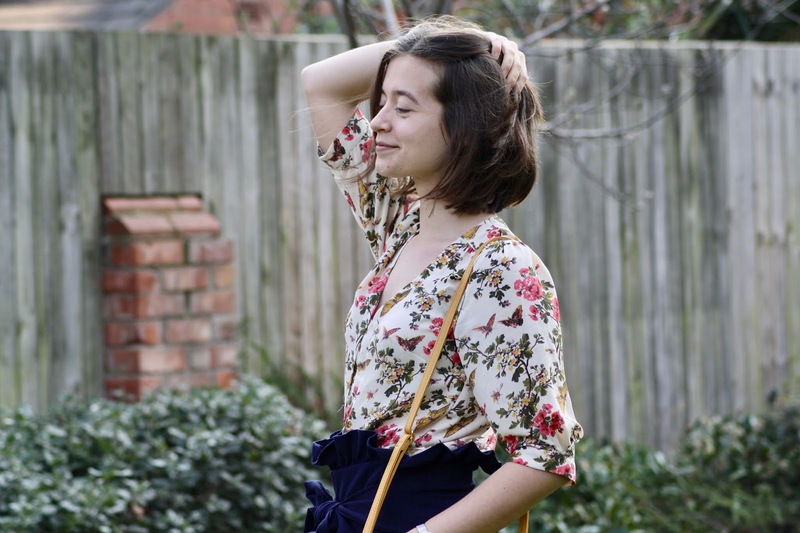 Spring is the season for new life after all, so breathing a bit of colour into our wardrobes after the dull of winter is something that I think we should all do in the early months of the year. Rixo have plenty of cute and colourful spring options on their website. Lizzie McGuire was ostracised for being an "outfit repeater" but honestly, I think she should've been applauded for it. It is important to remind ourselves in today's Instagram OOTD culture that there's absolutely nothing wrong with donning the exact same outfit you've worn a million times before, whether that's in everyday life or in your #fashionblogger shoots. That's exactly what I did in the photos for this post. 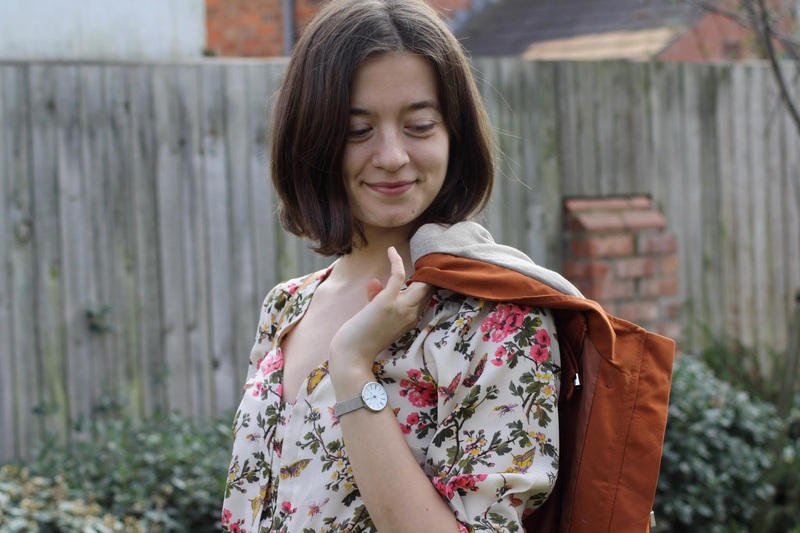 Those of you who have been reading my fashion content for a while may remember the beautiful yellow handbag that I've accessorised with here; it featured in my autumn styling blog post back in October 2018. While mustard is a colour most readily associated with autumn leaves, I think it still works perfectly for spring. As well as the turning of leaves, the colour yellow also makes me think of newly hatched chicks and daffodils coming into bloom, so I have no shame in rewearing this bag in spring. This season (and every season for that matter!) I'd love to see the reworking of older pieces and full on outfit repeating being a big thing for fashion influencers. Men everywhere will go to great lengths to assure you that size doesn't matter and for once, they're absolutely correct. 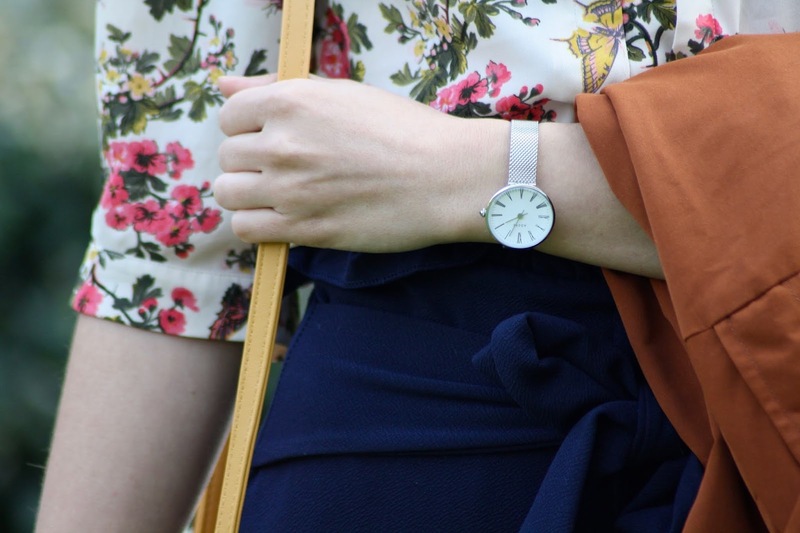 I have always liked keeping things small and simple when it comes to accessories, so when ADEXE invited me to feature their new Mini Sistine watch collection, I was delighted. I'm genuinely a big fan of ADEXE watches (my Instagram followers are very used to seeing their products all over my feed) so I was intrigued to unbox their latest launch. The Mini Sistine timepieces combine all of the usual class and quality of ADEXE watches with a new dainty, lightweight and elegant vibe. Small but perfectly formed, my Mini Sistine watch in silver has a smaller face than standard ADEXE watches, but still comes in a wide variety of colours, and (best of all) is available at a lower price point. Prices start at just £79. Combined with my 15% off discount code "ABBEY15", your new minimalist spring watch will be an absolute bargain! It might have been 2012 when Macklemore sang about "passing up on moccasins that someone else been had walking in" but that doesn't mean that visiting the thrift shop isn't still cool. I personally think that hitting up your local charity shop should be a massive trend for SS19. Buying secondhand is a great thing to do for reasons of eco-friendliness and sustainability. You never know what you're going to find at a thrift store and although it can take some searching, sometimes you turn up some real gems. Take the green heels I'm wearing in this post, for example. I've had them for about 4 years now and I absolutely love them! I discovered them completely by accident in a charity shop in Newcastle and snagged them for the bargain price of £4.95. They're so comfy, were in great condition even when I first saw them, and the quality is really impressive too, so they were definitely a steal. I would encourage everyone wanting to update their wardrobes for spring to pop down to their local secondhand shop for a rummage! That completes my list of alternative fashion trends for SS19 and now it's over to you. What would you really like to see in style this spring? Leave your thoughts down below! *The ADEXE watch featured here was gifted to me free of charge, in exchange for a blog post feature. The post also contains a sponsored link.